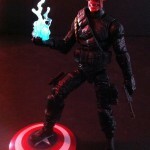 Thanks to ToyArk.com board member Bad Moon for posting up images of his Custom Marvel Universe Red Skull. In his late teens during the rise of the Third Reich, Shmidt got his most prosperous job, a bellhop in a major hotel. There he served the rooms of Adolf Hitler himself. By chance, he was present when Hitler was furiously berating an officer and swore he could train Johann himself, a simple bellhop, to be a better National Socialist. Looking closely at him and sensing his dark inner nature, Hitler decided to take up the challenge and recruited Shmidt. Dissatisfied with the standard drill instruction his subordinates used to train Shmidt, Hitler took over personally. Upon completion, Hitler gave Shmidt a unique uniform with a grotesque red skull mask, and he emerged as the Red Skull. His role was the embodiment of Nazi intimidation, while Hitler could remain the popular leader of Germany. The Red Skull was appointed head of Nazi terrorist activities with an additional large role in external espionage and sabotage. He was spectacularly successful, wreaking havoc throughout Europe in the early stages of World War II. The propaganda effect was so great that the United States government decided to counter it by creating their own equivalent using the recipient of the lost Operation Rebirth, Steve Rogers, Captain America. 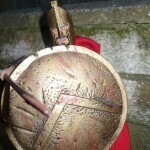 King Leonidas: Spartans! Prepare For Glory! Thanks to ToyArk.com board member tiger007 for posting up images of his custom King Leonidas. A new age has begun, an age of freedom. And all will know that 300 Spartans gave their last breath to defend it. The world will know that free men stood against a tyrant, that few stood against many, and before this battle was over, even a God-King can bleed. Check out all the custom King Leonidas images after the jump. 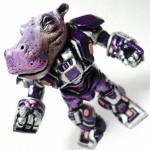 Thanks to ToyArk.com board member astig for posting up his custom TMNT Metalhead. Metalhead is a turtle-like remotely controlled robot built by Donatello. Donnie salvaged an abandoned Kraang-droid body after a battle and decided to use its highly advanced technology to build an upgraded weapon for himself. The result was Metalhead. He resembles the turtles themselves yet stands about a foot shorter. He has a bandanna built onto his head that is yellow in color and the back of his shell is made from a New York City manhole cover. 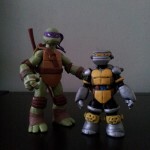 View all of the new custom TMNT Metalhead images after the jump. 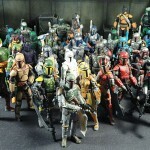 Thanks to ToyArk.com board member “Toy Master” for posting up his custom set of Star Wars Mandalorians! The Mandalorians remain the most formidable enemy of the Jedi: but the Sith are not always their allies. The Mandalorians even worshiped war itself, then simply turned their backs on their god. You might begin to understand them one day. Check out the custom set of Mandalorians after the jump. 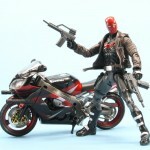 Thanks to ToyArk.com board member packratstudios for posting up his Red Hood custom. In the original Batman Detective Comics, the Red Hood was a master criminal, and his costume consisted of a large domed red helmet and a red cape. While attempting to rob a chemical plant, his men were beat-down by Batman and then he was suddenly cornered on a catwalk. Left with no alternatives, he dove into a catch basin for the chemicals and swam to freedom, surviving because of a special breathing apparatus built into the helmet. The toxins in the vat permanently discolored him, turning his hair green, his skin white and his lips red. Upon discovering this, he went insane and adopted the persona of the Joker. Check out all of the Red Hood images after the jump. 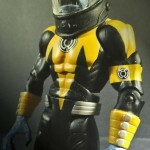 I just spent the last hour browsing the amazing customs by ToyArk.com boards member Ersico. The Battle Beast customs initially caught my eye, but then I got drawn in by the amazingly strange creatures and outstanding paint work on these customs. If you have a few minutes jump into this thread and check out images of Zombies, Sea Creatures, Glyos, Sculpted Munnies and Vinyls. Many more images of Ersico’s custom work after the jump. 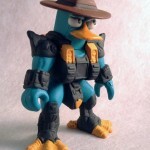 Thanks to ToyArk.com boards member “delta chameleon” for posting up images of his custom Perry the Platypus – Agent P from the Battle Beast universe. Rub the Battle Badge on each beast to see what appears. It’s either fire, water , or wood. Water beats fire, Fire beats wood, Wood beats water. You never know what Beast has what badge until you get it home. Battle Beasts – half-animal, half-human creatures that can turn your room into a jungle. Many more Perry the Platypus Battle Beasts images after the jump. 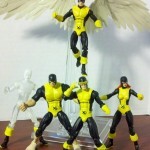 Thanks to ToyArk.com boards member ultraman zoffy for posting up his iconic Original 1963 Uncanny X-Men custom team shot. The master of magnetism has taken over a missile base, and only the strangest teens of all time stand between him and victory! It’s the X-Men’s first day of class, and Magneto wants to make it a memorable one — and their last! 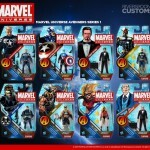 Check out the Original 1963 Uncanny X-Men Marvel Universe custom after the jump.